Collective memory is an important part of national identity and is the vehicle for societies as a whole to reflect upon the nadirs and apexes of its history. It is easy for nations and societies to talk of their greatest achievements, it is a far more difficult task to approach their greatest atrocities. It is hard to come to terms with actions committed that led to the marginalization and murder of certain ethic, racial, or religious groups by the same society one identifies with. This paper will narrow its focus on a comparison of collective memories. American society has a collective memory with African Americans, and German society has a collective memory with the Jewish people. While the exact method of marginalization of these two groups were extremely complex and different, both cases led to the need for proper collective memories that address these atrocities. Both American and German societies need to remember and come to terms with their actions in order to progress in a way that can promote the inclusion of marginalized groups into society. A strong approach to start this process is the use of memorials and monuments to remember events during the dark times of a society’s history. Both America and Germany have tried to address their respective negative pasts, but Germany is far more advanced in the regular discussion of their atrocities than America. 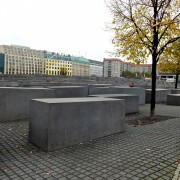 Memorials and monuments play a large role in creating a collective memory, and Germany’s approach to this has created a stronger discussion of their marginalization of Jews than America’s discussions on race relations with African Americans. Gould and Silverman mention that not only are these monuments and memorials very public and unavoidable, they are also not glorifiable. 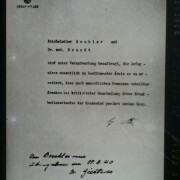 Monuments were erected with the intention to prevent the forgetting of events, such as the Holocaust. 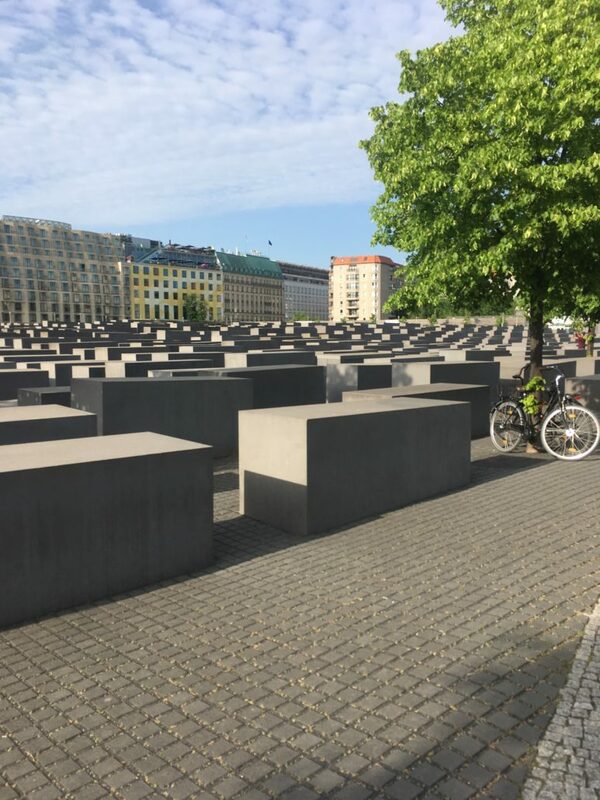 While there are many different Memorials or monuments to choose from in Berlin, the best example of how Germany has weaved collective memory into their landscape is The Memorial to the Murdered Jews of Europe. 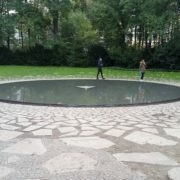 This memorial is within Berlin’s Memory District, so not only does Berlin have a whole district integrated with a myriad of memorials and monuments, but normal civilians live there and come into contact with memorials regularly. 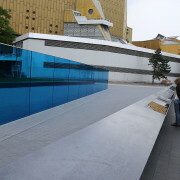 The photo shown here is just a section of the memorial and is contained with the landscape of urban housing in the background. 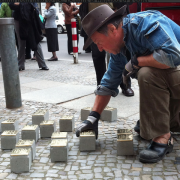 Collective memory collides with average lives daily in Berlin, so the city faces the history of the Third Reich and the Holocaust regularly and conversations about it are unavoidable. Germany’s past 100 years is a history that the society is not proud to have, but there is a collective effort throughout Germany to address its past and present it to the masses, regardless of interest in the history of Germany. 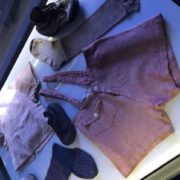 This effort to keep events such as the Holocaust in Germany’s collective memory has promoted progress in German society, as they look to not only memorialize the past, but to move past their dark era and to own their actions. The United States has not taken a similar approach to memorialization, and it has effected society’s collective memory. America’s biggest transgression is its treatment of African Americans throughout the nation’s history (and even before it). From slavery, the Civil War, and Reconstruction to the Klu Klux Klan, Lynchings, and segregation, millions of African Americans have been marginalized by American society. There are no memorials or monuments in the United States that are intertwined with American life that discuss this issue. Memorials and Monuments are out of the way of normal life in most cases in the United States, Washington D.C. for example, or are in the North, even though the vast majority of transgressions against African Americans were committed in the South. Monuments and memorials that do address actions against African Americans mainly address the positive progress that came out of the Civil Rights era, such as the leadership of Dr. Martin Luther King or the Civil Rights Act. Memorials in America need to regularly address the darker aspects of their transgressions against African Americans in order to create a collective memory that is more wholesome and complete. 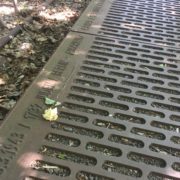 Memorials for the actions against African Americans are not present in the lives of many Americans, so society can easily disconnect or avoid the topic in its entirety. This leads to American collective memory easily forgetting transgressions against African Americans as if they never happened or were deviant from American history. If America was truly ready to inspire progress and receive forgiveness from African Americans, places like Alabama, Mississippi, Missouri, Arkansas, Tennessee and across the United States would have made their actions against African Americans a part of their history and their memory. Race relations in the United States would be in a better state if American society were more ready to discuss the nadir of race relations and not avoid the topic or leave in solely in the classroom. Germany is further along than the United States in addressing the darker eras of their history through their collective memory. Germany’ use of memorials and monuments within its modern society has played a large role in why they are better armed to discuss past atrocities. Germany has chosen not to hide their history from their society, and their progress for reconciliation with the Jewish people is further along because of it. America needs to utilize memorials and monuments as a part of public areas more if they hope of ever achieving a post-racial society. There is a rift in America about the collective memory of the marginalization of African Americans, and these memories need to be unified if American society ever hopes to progress. Memorials and monuments can help with this process, as regardless of whether one is a tourist or a resident, memorials and monuments are permanent fixtures of an area and attract people to it as a place of learning about a nation’s history and culture. Source: Mary R. Gould & Rachel E. Silverman, “Stumbling Upon History: Collective Memory and the Urban Landscape” in GeoJournal. 78 (2013). 792.